Aldo Conterno’s 2013 Cru’s. 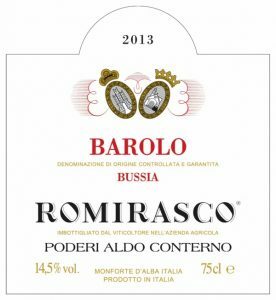 Is this the DRC Barolo? + Granbussia Riserva! The wine point system has some major flaws, but, scores of 2 x 100, 1 x 99, 2 x 98 and 1 x 96 in a lineup, suggest something has to be heading in the right directions! Aldo’s son, Giacomo, speaks to their continued drive to raise the bar. The estate has gone from 200,000 bottles in the 1980’s to around 80,000 today from the same, 25 hectares of vineyard. Combined with this skin contact has increased to 5-6 weeks. This for me is a sign that the depth of fruit has increased, enabling or perhaps requiring the extended skin contact to tame it and further enhance the mouthfeel of the tannins. Romirasco perhaps the most ageable in Giacomo’s opinion. *Quantities of the Cru’s are extremely limited. We’ll do our best to fill your request. Following allocation, the wines will be invoiced in full when allocation have been finalised and they are ready for delivery. Aldo Conterno's 2013 Cru's. Is this the DRC Barolo? + Granbussia '08 '06 '05 + magnums! 1.5L The Devil is tapping on your shoulder making you thirsty! $666 with any other wine. Granbussia 2008, 2006 & 2005 The differences in pricing are due to the business not increasing prices over time to reflect price increases from the winery and due to market demand. We have chosen to pass on the savings! Quantity pricing will be applied when you order is processed. VINEYARD: different vineyards, in Bussia Bussia (Monforte d’Alba). NOTES: the grapes used to make Barolo come from vineyards which are at least 15-20 years old. This shows a beautiful complexity of ripe fruit such as cherries as well as orange peel undertones with lemon and pineapple highlights. Medium body and well-defined tannins. Drink in 2020. A fragrant style, offering rose, cherry, earth, mineral and cumin aromas and flavors. Young and tense, yet shows fine potential, with complex flavors, good structure and a long aftertaste. Best from 2023 through 2040. It may be a so-called entry level Barolo, but the 2013 Barolo Bussia definitely delivers the goods. Fruit is sourced from three separate points within the larger Bussia cru. These sites are characterized by clay soils with southeast exposures and approximately 25-year-old vines. The quality of fruit is very intense and defined with dark cherry and dried blackberry. Yet the mouthfeel is ethereal, light and buoyant. Keeping in line with the vintage, the tannins are firm and slightly rigid. However, they are well absorbed by the exuberant nature of the fruit. 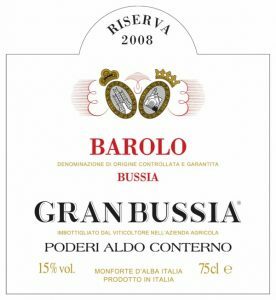 The wine's personality is reminiscent of the Barolo Bussia Cicala. The aromas of flowers, blackberries, and white truffles are superb. Full to medium body and ultra-fine tannins. The finish lasts for minutes. An amazing Cicala. Don't miss this. Drink in 2022. The 2013 Barolo Bussia Cicala is a beautiful wine with impressive depth and a profound sense of sharpness. This part of the Bussia cru sees a mix of clay soils (40%) with limestone (60%). 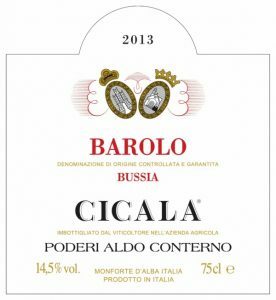 In a sense, Cicala is the most indicative of the greater Bussia cru both in terms of its geological properties and its general taste profile. You get a lot of fruit in this wine followed by tannic firmness and evident power. Together, the wine presents balanced results. The alcohol here is 14.5% and I'm told that the upcoming 2016 vintage is almost a full degree stronger. The 2013 Barolo Bussia Colonnello is the most ethereal and delicate of the Bussia series of wines. Fruit is sourced from a portion of the Bussia vineyard that is located closer to the village of Barolo (one kilometer away) than it is the village of Monforte d'Alba (five kilometers away). The sandy soils found here make for softer and tamer tannins especially when compared to the other parts of Bussia. The bouquet opens to aromas of blue flowers, spice, wild berry, licorice and white truffle. This is a softly nuanced and finessed Barolo made with fruit from 45-year-old vines. Menthol, pressed rose, iris, woodland berry, chopped mint and a whiff of oak-driven spice take center stage. It's still tight, with youthfully assertive refined tannins but it also boasts layers of red cherry, raspberry compote, cranberry, licorice and vanilla alongside bright acidity. Thanks to its age-worthy structure, you'll need patience for this one. Drink 2028–2048. Counted by Giacomo Conterno as their most important vineyards. Known for distinct spice and complex soil types. The oldest vines of the estate rest in this vineyards. Romirasco perhaps the most ageable in Giacomo’s opinion. 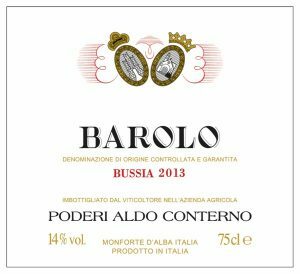 In 2017 this is right in the drinking window for Barolo. Now 12 years old it has a wonderful core of fruit, with great nuanced secondary development, bags of truffles, violets, supple long tannins and lingering fruit. Just so enticing. Beautiful balance, incredibly harmonious. Draws you in! Make sure you decant it.